Links to all my writings and blog posts about Cornell’s proposed Fine Arts Library can be found here. The Fine Arts Library proposed for Rand Hall at Cornell University has two stories, each with a mezzanine floor, for a total of four levels all linked by a single continuous vertical opening. Vertical openings in buildings are—with some important exceptions—prohibited by Building Codes because they present a serious fire and smoke hazard if not properly designed or protected by a continuous and fire-rated shaft enclosure. The most common exception to the general prohibition of vertical openings states that any two stories may have a vertical opening between them. This much is clear. However, when mezzanines are introduced, things get more complicated and additional exceptions to the general prohibition against vertical openings must be analyzed. 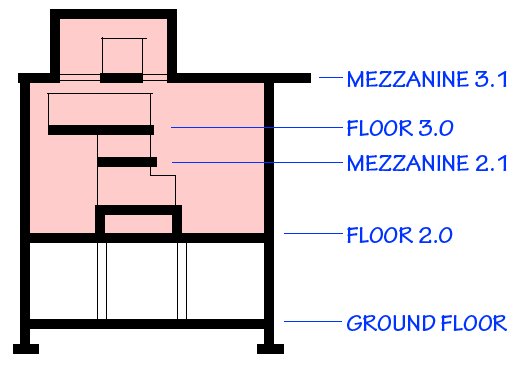 The 2003 and 2007 versions of the New York State Building Codes—the first that were based on the International Building Code (IBC)—state in Section 505.1 that: “A mezzanine… shall be considered a portion of the floor below.” This is important because the exception allowing two-story vertical openings (in Section 707.2 of the 2010 NY State Code or Section 712.1.9 of the 2015 NY State Code, for example) specifically allows such openings to connect two stories, but only as long as they also are separated from other floor openings. Because mezzanines were previously defined as being part of the floor below, they were not considered as separate floors, and therefore didn’t count as additional floor openings under the terms of this exception. In other words, the four interconnected floors in the Fine Arts Library proposal might have been acceptable under these older Codes (assuming that all other requirements governing maximum mezzanine size were satisfied). However, in all subsequent versions of the New York State Building Code, including those from 2010 through 2015, a single word in Section 505.1 (or 505.2 in later versions) was changed, so that a mezzanine is now considered a portion—not of the floor below—but of the story below. With this seemingly innocent change—from floor to story—the exception in Section 707.2 of the 2010 Code (or Section 712.1.9 of the 2015 Code) allowing floor openings connecting no more than two stories as long as they are also separated from other floor openings now has a very different meaning. With mezzanine floors no longer included as part of the floor below, but still considered as independent floors, the requirement that any vertical opening linking two stories be separated from any other floors is no longer satisfied if mezzanines are present. It is no longer possible to ignore the mezzanine floor levels by claiming that they are part of the floors below them. There are only two other potentially viable options for designing “vertical openings” for a new Fine Arts Library in Rand Hall, per Section 712.1 in the 2015 NY State Building Code. The first such option—having a vertical opening between a mezzanine and the floor below—clearly doesn’t work for the Fine Arts Library proposal, since only a single mezzanine and floor can be linked together using this option. The only other viable strategy is to design the vertical opening as an atrium. This entry was posted in Architecture, Milstein-Rand-Sibley Hall on February 28, 2017 by jonochshorn.